Toll tax is very common in every city and thus "toll tax system" is very important. This project use infrared technology for Toll Tax System. This project uses infrared for sensing the vehicle and will display the amount to be paid off. This is good final year project for students thinking to make project based on microcontrollers. You can also Subscribe to FINAL YEAR PROJECT'S by Email for more such projects and seminar. The term “infrared” refers to a broad range of frequency starting at top end of those frequencies used for communication and ending up to the low frequency (red) end of the visible spectrum. That means infrared light has a range of wavelength, just like visible light has wavelength that range from red light to violet. “Near infrared” light is closest in wavelength to visible light and “Far infrared” is closer to the microwave region of the electromagnetic spectrum. The aim of this project is to design a high tech toll tax system using microcontroller, so that the vehicles need not to stand in a queue for a long time to pay the toll tax. Now by using a microcontroller, tax paying become very simple. There is a alarm which blow as soon as it detect a vehicle and it can be sensed through an IR sensor, and the amount to be paid off is also display. When driver paid off the tax it allow to move further. This system takes very small time, thus prevent the jam to occur . This system is based on transmission and reception of IR. IR sensors are sensitive to car moving in the field of view. For car parking a region IR is send in that region from one end and it is received on the other end. When a car enters in that region it cut the infrared, so at that moment receiver doesn’t detect any signal and absence of IR is sensed by receiver which in turn generate a low pulse on the microcontroller pin, then microcontroller read the pin and run according to software loaded in it and blow an alarm. The transmitter and receiver are connected to the main device. The main device has power supply, microcontroller and a FND connected to it. 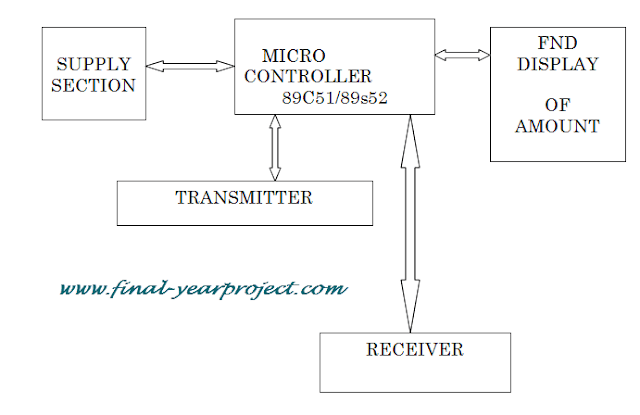 This Micro-controller project report on Toll tax system includes chapters like introduction, platform, aim of the project, block diagram, working of the project, circuit diagram, circuit description, PCB layout, programming, sensing unit description, components description, application, future scope, conclusion and reference. Use this report for your reference and study work.